Note: Catch-22 is missing from this list. Need to spice up your writing? Well, here's a list of synonyms for common words. Perhaps you'll find a better word next time. But remember: a thesaurus can be your enemy as well as your friend. Last Saturday I sat on a panel at the Ohioana Book Festival called Publishing: Let's Count The Ways. There were four authors and we'd all published both traditionally through a publisher and self published our own books. It turned out to be an amazing panel and what I took away from it was that a lot of people have questions about self publishing. Some don't even know where to start. So, with that in mind, I'm going to be writing a series of blog posts to hopefully help some of you out there who are thinking about self publishing. There's a lot to know if you choose to go the self publishing route and I don't claim to know it all, but hopefully I'll be able to share some of my knowledge. You've written your novel, so now what? Do you find an agent? A publisher? Or do you self publish? I’ve decided to try something new! 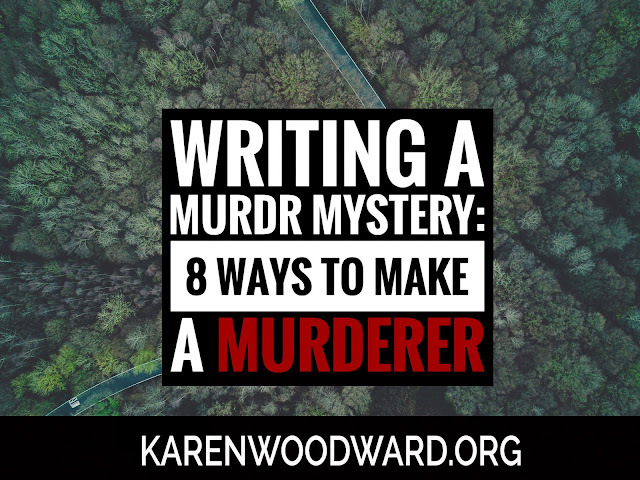 As many of you know, I’m putting together a book on how to write a murder mystery. As part of that I’ve begun developing an example story, a traditional murder mystery with elements of a cozy. When I sat down to write this blog post I had an idea: Why not take a deep dive into this material and try it out on my blog! I’ve been thinking about how to structure this and hit on the idea of doing a “theory” post—talk about an element of structure—followed by an example post—take the previous day's theory and use it to create an outline. For example, this post gives 8 tips for creating a murderer. Next post I will step through each tip and use it to create the murderer. This is just the start, though. Over the next few weeks my plan is to develop an outline for a murder mystery I’m calling Murder at Meadowmead. The following books are available for review. All you have to do is click the link that says, "Click Here to Request a Review (tweet)." Then you can tweet that specific author. Lose vs. Loose I admit it…this one drives me absolutely bonkers. Especially having spent time on various fitness, weight training, and nutrition pages; these two unrelated terms are accidentally interchanged all too often. You see yourself standing at the edge of a busted, falling apart building. You are watching the world being devoured by monsters. Death, it is all around you. The city you once knew, is literally being destroyed. After the destruction, the very threat is still imminent. Now you are on the run, hunting for shelter, food, and people who are not going to kill you just for sport. And now, you face a greater task, leading a band of survivors, they entrust you to lead them away from danger, and into a new world. What would you do? Back at the beginning of March I posted a video about a new food fad, Hard To Resist And Totally Outrageous Bubble Waffles! Boy did they look [good] and considering how many people look at that post, it was something you guys really liked! It’s been exciting to update all 17 Transformed covers. I’m equally thrilled about these side-story covers as I am about the 12 new covers for the main series! All of these books can be read as standalones or in addition to the main books. Read below for the descriptions of each! There are 7 billion people on the planet, and I’ve met many bloggers in all niches, and not one of them has ever had 7 billion views on a blog post. Nope. Not one of them. Why are their posts not getting the views? Because to say their headlines are somewhat lacking is the understatement of the year. Curiosity killed the cat, so they say, but it’s also what gets your headlines clicked, your blog posts read and your calls to action acted upon. That’s right! A headline can do many things, and when they contain curiosity they can do so much more! Read the rest of the blog post here! I need books to tweet about. To find out more about our tweet marketing services, check out this post. Tweet packages start at just $2! Tired of dragging your kids to the grocery store? Check this out. The following is a repost from another blog. Check out the full article HERE. When reviewers have conflicting views it gets really interesting… You may have heard… I released a new book yesterday, Last Winter’s Snow. Congratulations to me! And for a couple of weeks or so, reviews have been coming in, and they have mostly made me very happy, because a lot of the things I’ve read were very encouraging, and positive. However, and this is the really interesting part, and this post will look at reviews from both a reader perspective and an author perspective, I’ve had two reviews that took opposing sides on a single issue. I’m not going to take sides, but let’s hear from the reviewers themselves: Read the rest HERE. Oh no! Computer problems! No worries, problem solved. Here are the products Amazon recommends from the category Computer.